Portion sizes are nearly 20 percent bigger than they were 30 years ago, a new study finds. 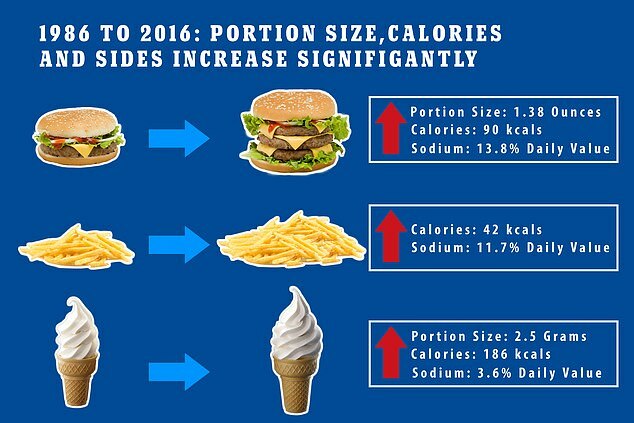 Researchers say that – despite attempts to add healthier menu options – the number of calories and sodium have increased as the amount of burgers, fries and ice cream in our meals have swelled. Over the last three decades, entrées have about 90 more calories than they once did while nearly 200 calories have been added to desserts. Additionally, nearly 14 percent of the daily recommended value of sodium has been added to our sanwiches and about 12 percent has been added to our fries and chips. The team, from Boston and Tufts Universities, says the results show that the larger portions and calories have likely played a huge role in the obesity epidemic crippling the US. Fast food has become a staple among the diet of US adults, making up 11 percent of all Americans’ daily calories between 2007 and 2010. This is nearly triple from what it was between 1977 and 1978 at four percent of daily calories. A report released last year from the Centers for Disease Control and Prevention show that 37 percent of Americans eat fast food every day. Adults aged between 20 and 39 are the most likely group to consume fast food, with almost half (45 percent) admitting they eat junk food daily. 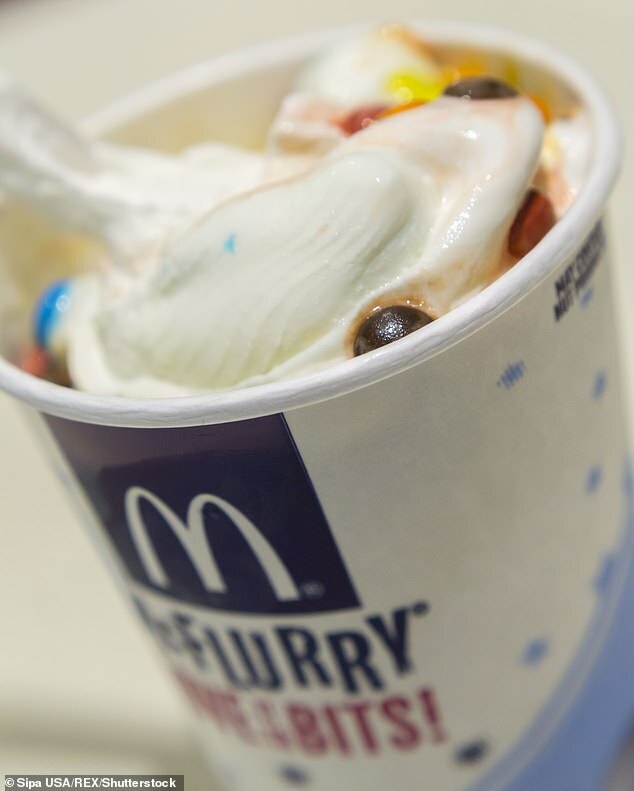 For the new study, published in the Journal of the Academy of Nutrition and Dietetics, the team looked at menu items from 10 of the biggest fast food chains including McDonald’s, Burger King, KFC, Dairy Queen and Wendy’s. Researchers looked at data for entrées, sides, and dessert items from 1986, 1991 and 2016. The total number of items spiked by 226 percent over the last three decades, roughly 23 new items a year, but it wasn’t good news when it comes to nutritional content. 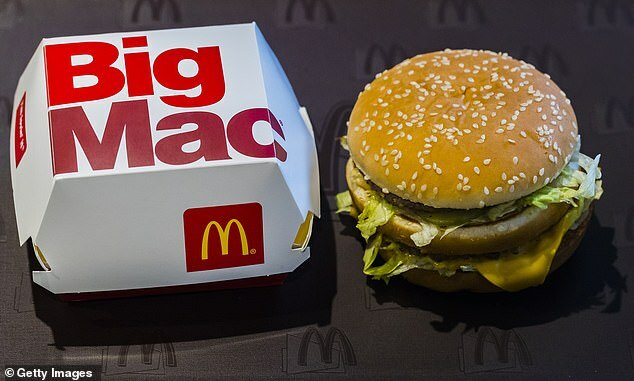 ‘Despite the vast number of choices offered at fast-food restaurants, some of which are healthier than others, the calories, portion sizes, and sodium content overall have worsened [increased] over time and remain high,’ said lead investigator Dr Megan McCrory, a research associate professor at Boston University. Calories in all three categories increased mainly because of portion sizes increasing. Per decade, entrée sizes rose by 13 grams and about 30 calories, while desserts increased by 24 grams and about 62 calories. Portion sizes for sides remained roughly the same, but the number of calories rose by about 14 calories in each decade. ‘When we look at the sources of what calories are, they’re not supplying healthy nutrients,’ registered dietitian Andrea Chernus of Chernus Nutrition in New York City told DailyMail.com. The amount of sodium also rose per decade in each category, by about 14 percent in entrées, 12 percent in sides and four percent in desserts, based on daily value recommendations. One bright spot is that calcium and iron have increased in these menu items, based on data from four of the 10 restaurant that were studied. Based on daily recommended values, calcium content of desserts increased by about four percent per decade and iron increased by about 1.5 percent per decade. But, in regards to calcium, Chernus believes this is because there has been a greater consumption of higher fat milk-based products. ‘Restaurants have added more options like ice cream, frozen yogurt, milkshakes, and there’s been more cheese added to entrées,’ she said. She also warned that excess iron is not good for everyone. ‘It can be harmful for certain groups. For example, postmenopausal women don’t need excess iron,’ Chernus said. According to the Mayo Clinic, women of child-bearing need about 18mg of iron per day. After menopause, the requirement falls to about 8mg. Meanwhile the National Institutes of Heath recommend that adult men receive between 19 and 20 mg. 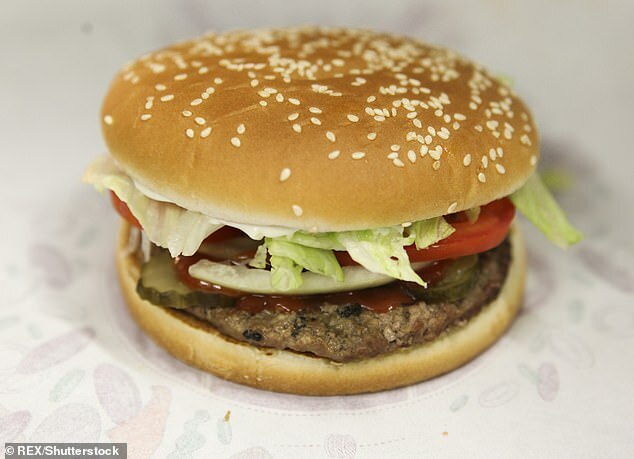 So for example, a Burger King meal consisting of a classic Whopper, side garden salad and Hershey’s Sundae Pie consists of about 13mg of sodium – more than half of an adult man or woman’s daily recommended level. Excess iron is stored in organs such as heart, liver and pancreas and can lead to deadly conditions such as heart disease, liver disease or diabetes. Dr McCrory says she hopes the study’s findings lead to research on how consumers can eat healthier at fast food restaurants. ‘We need to find better ways to help people consume fewer calories and sodium at fast-food restaurants,’ she said.